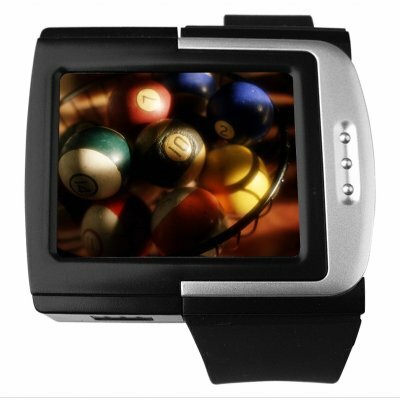 Successfully Added Cool Black MP4 Watch Player 4GB - 1.8 Inch Screen to your Shopping Cart. 4GB MP4 Player Watch specially designed to have a smooth look and feel with a cool black trim plus excellent design, and comes with a 1.8 Inch LCD Screen perfect for watching your favorite movies. It also features a recordable FM radio able to be used almost anywhere in the world, a built in high quality Speaker for listening without earphones, and adjustable time/ date/ day display. I only ordered a little over a week ago and it arrived yesterday... super timing. Everybody at tech has said how cool it is and several of the cuter girls around campus have stopped me and commented on my watch. Excellent.